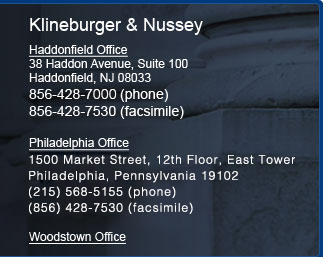 D. Ryan Nussey is a partner in the law firm of Klineburger & Nussey, with offices in Haddonfield and Woodstown, New Jersey and Philadelphia, Pennsylvania. He graduated from the University of Delaware with a degree in Political Science and Spanish, and attended the Widener University School of Law. During law school, Ryan worked in with the Juvenile Advocacy Program where his interest in family law was peaked. Ryan focuses his practice primarily in the area of family law and has been Certified by the Supreme Court of New Jersey as a Matrimonial Attorney. In his practice, he handles all aspects of divorce, custody, alimony, child support, pre-nuptial agreements, civil unions, and domestic violence. He is a barrister with the Thomas S. Forkin American Family Law Inn of Court, and is the past -president of the Salem County Bar Association. He was recently appointed as the Trustee for Salem County to the New Jersey State Bar Association at the New Jersey State Bar Association Annual Meeting on May 20, 2010. 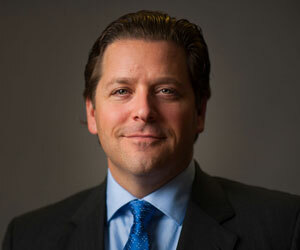 Ryan is an active member of the various Bar Associations, including Camden County, Gloucester County, Salem County as well as with the New Jersey State Bar Association, and is on the Family Law Executive Committee of the New Jersey State Bar association. He has lectured in family law with ICLE and through the Court system with the Parent Education Program. As the head of the Family Law Department at Klineburger & Nussey, Ryan focuses on working towards resolutions that fit the needs of the particular client, while always prepared to litigate if the case requires such an approach. In the unique world of Family Law, Ryan and his associates are well-versed in the prevailing law and always work towards a result that is in the client�s best interest. In his free time, Ryan is an active runner and tri-athlete, who participates in many events per year.